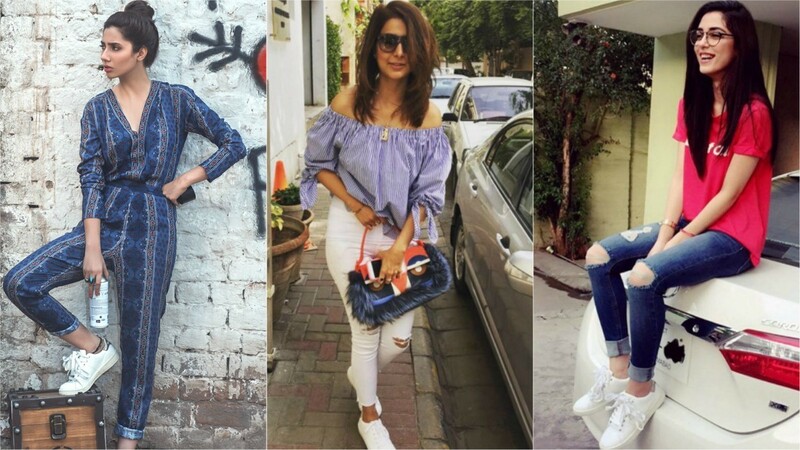 If you are thinking which trousers are in fashion this year in Pakistan, you are at the right place because this article is all about stylish trouser designs for ladies 2018. 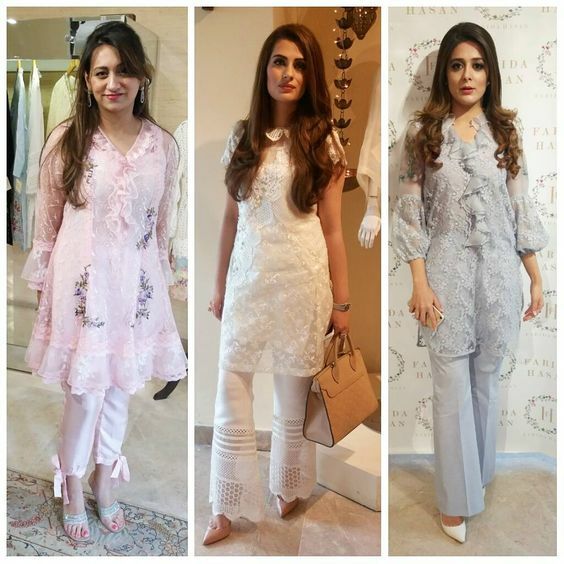 This post features more than fifty trendy trouser designs 2018 in Pakistan so keep reading this post for all sort of trouser trends in Pakistan. 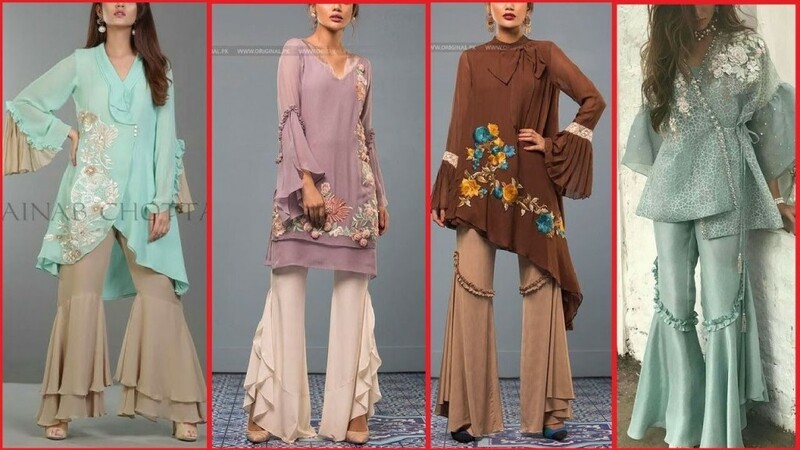 I tried to compile stylish trouser designs for ladies which can go with any dress with a hope that it will help you to select an appropriate trouser design to do it yourself or get it stitch from tailor/tailoress. 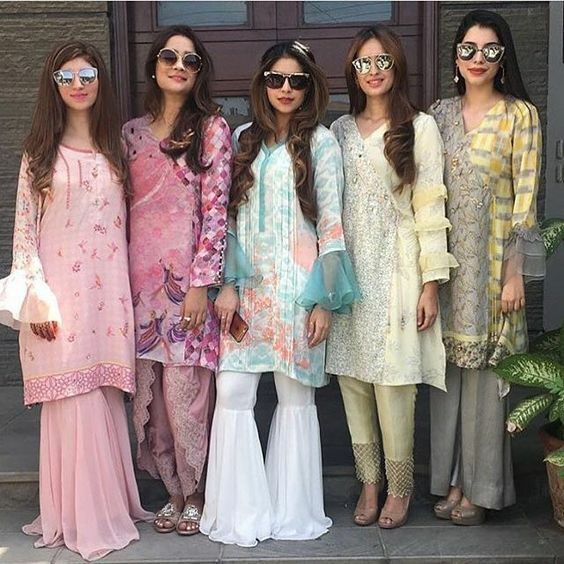 Take a closer look at the picture above, you will see that every lady is wearing a different trouser style that include tulip shalwar, straight pant, sharara and wide length pant which reveal different trouser designs 2018 are in vogue in Pakistan either for party wear or casual wear. 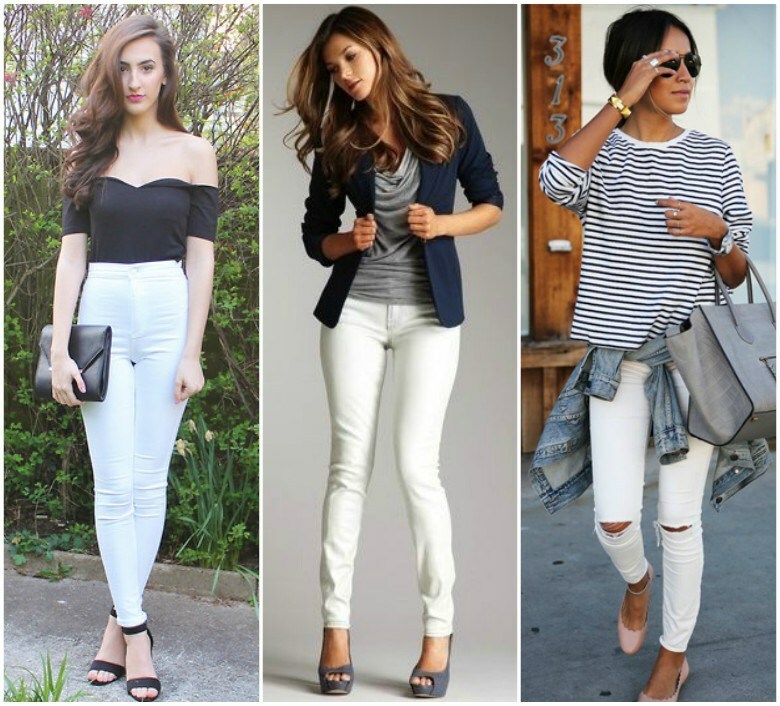 Pro Tip: White, black and beige colored trousers or pants are wardrobe must haves for every women or girl, since these colors can be mixed and matched with any shirt accordingly. 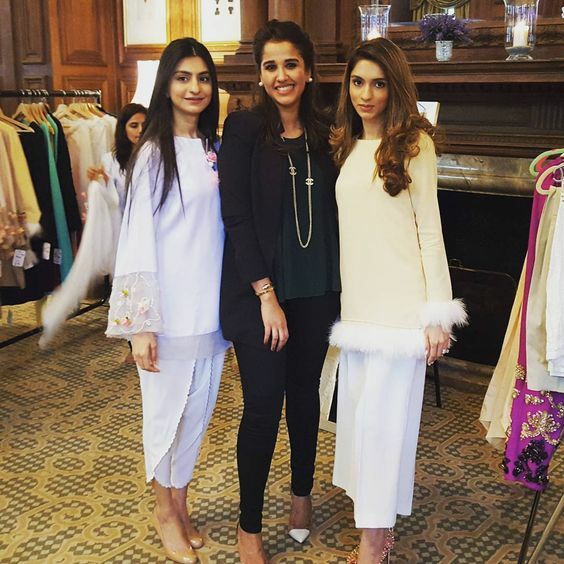 Bell bottom pants are in fashion since last year in Pakistan and they will remain in trend this year. 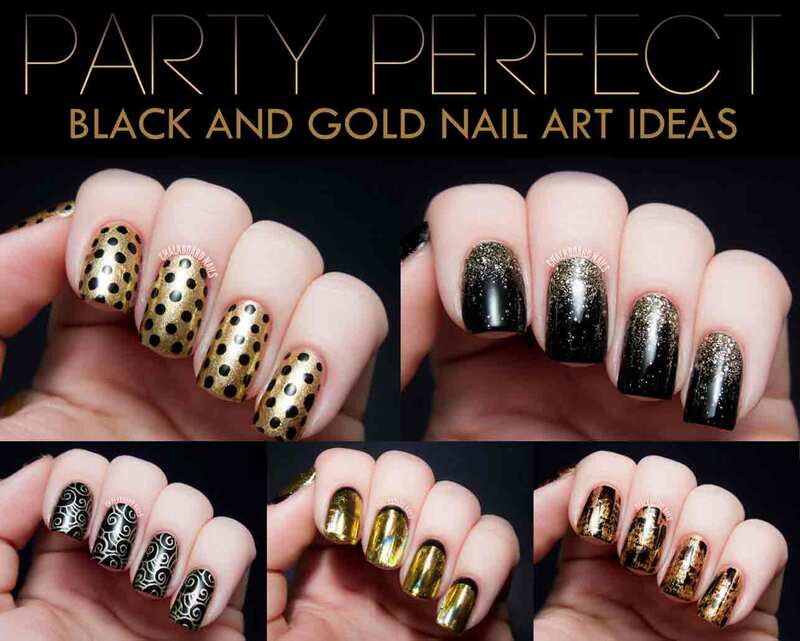 These can be paired with any style of shirt whether party wear, casual or with even lawn outfit. Below have a look on bell bottom pants designs to get some inspirational ideas. Pro Tip: Bell bottom or boot cut trouser is the right choice for those short ladies and want to look tall because it gives the illusion of longer looking legs. 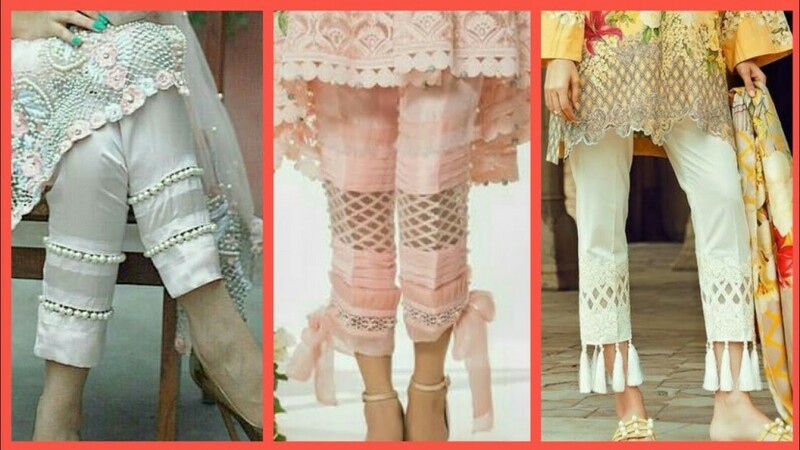 Pro Tip: As we know stitching is like an art so you can stitch bell bottom pants in variety of stylish designs by adding lace, ribbon, pearls, organza and embroidery etc. 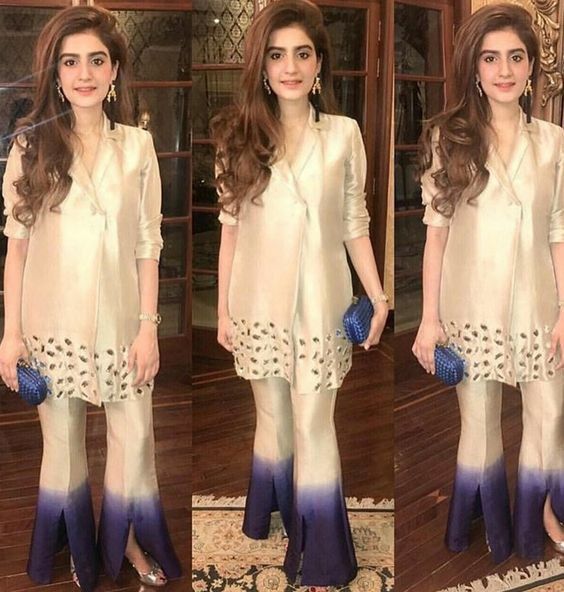 Tulip pants are on scene since last two years and will be in fashion this year as well because designers are equally supporting tulip trend not only in Pakistan but also in Indian fashion weeks. 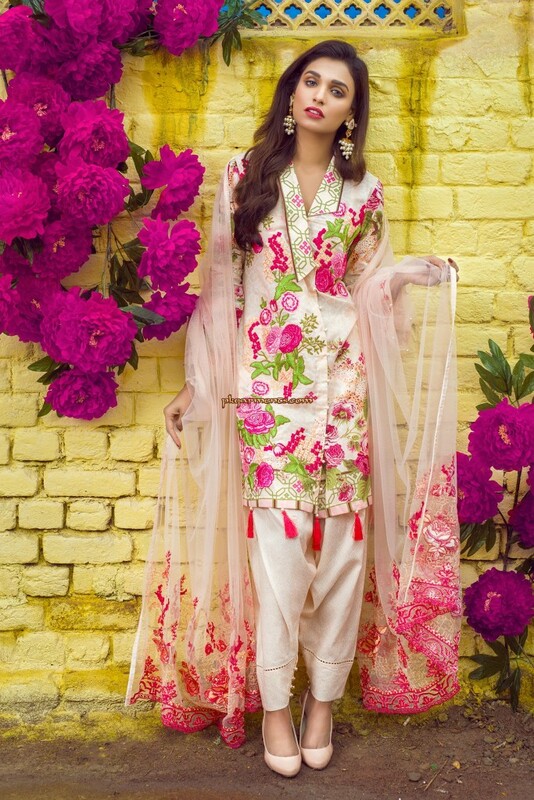 Again tulip shalwar can be stitched in various styles with laces and embellishment for this take a closer look at the pictures below. 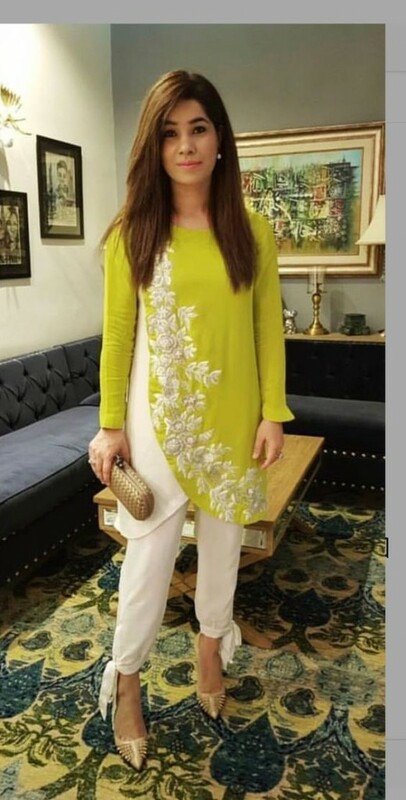 Pro Tip: Tulip shalwar can also be worn with party wear dresses, lawn dresses and semi formal dresses if you want to achieve a traditional look. 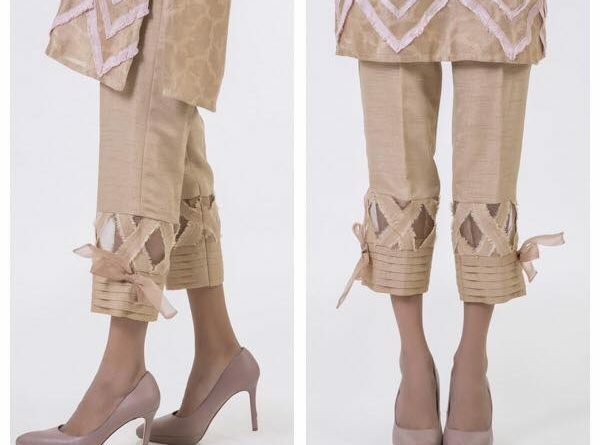 khussa shoes or punjabi jutti complement a lot with tulip pants so why not to have a look on chic khussa designs. Plain trousers or straight pants are in vogue from last many years because they give a classic look to any attire. 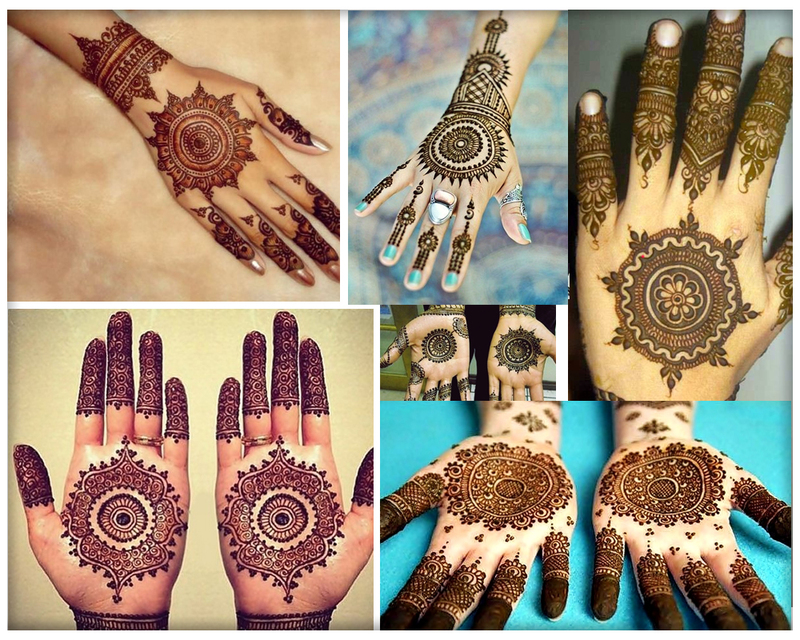 These can be paired with any shirt, kurta, frock and kameez, and can be stitched in different styles like shown below. Pro Tip: when in doubt which bottom style is right, go for straight bottoms because it is the safe choice. 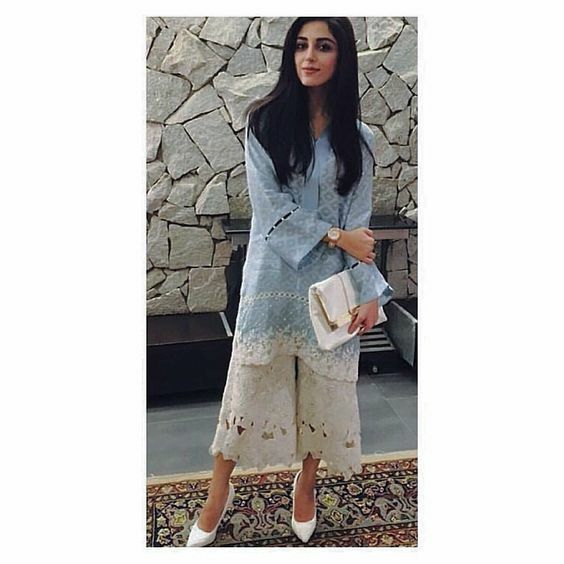 Plain shalwar was the only pants that were worn by Pakistani ladies, then due to the emergence of fashion designing their trend faded but this year plain shalwar came back again on runways. Because of loose fitting it is one of the most comfortable pants to wear in summer seasons. 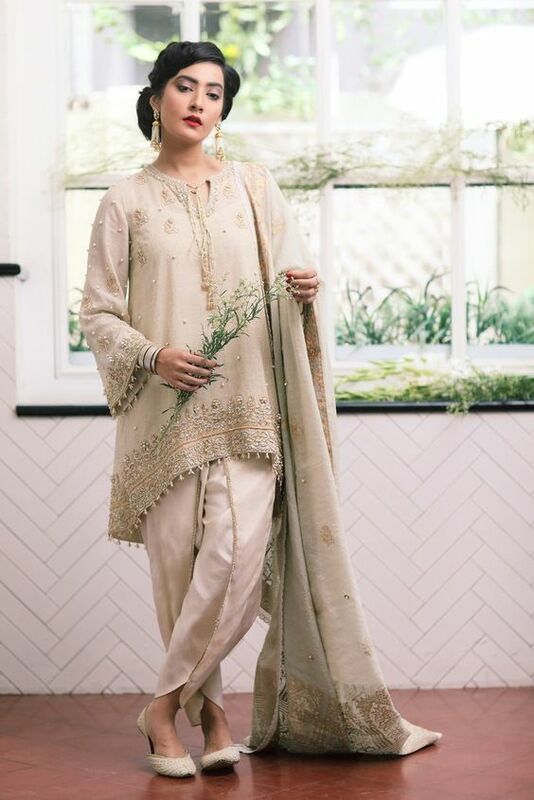 Sharara pants wear worn in mughal era in subcontinent and is considered as a traditional style bottom but last year it came back with a roar, every designer presented their formal, semi formal and casual collections with sharara or gharara. 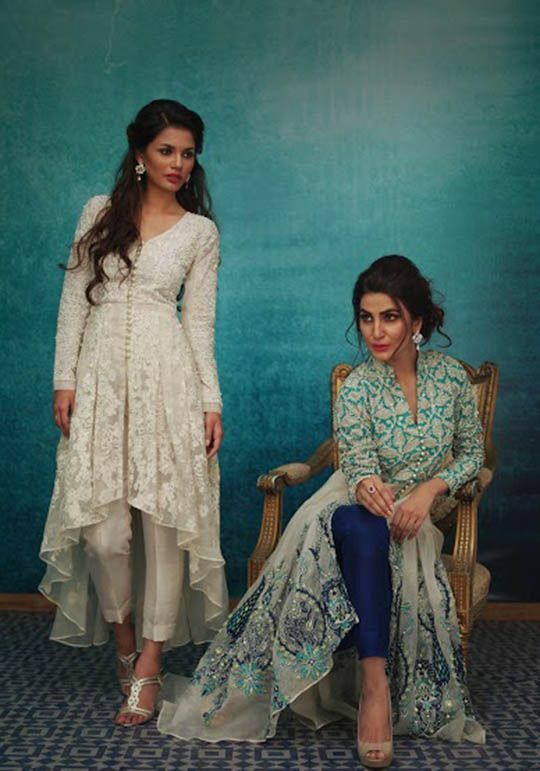 Still it will remain in fashion in Pakistan so let’s peep into some stylish sharara pants pictures here. 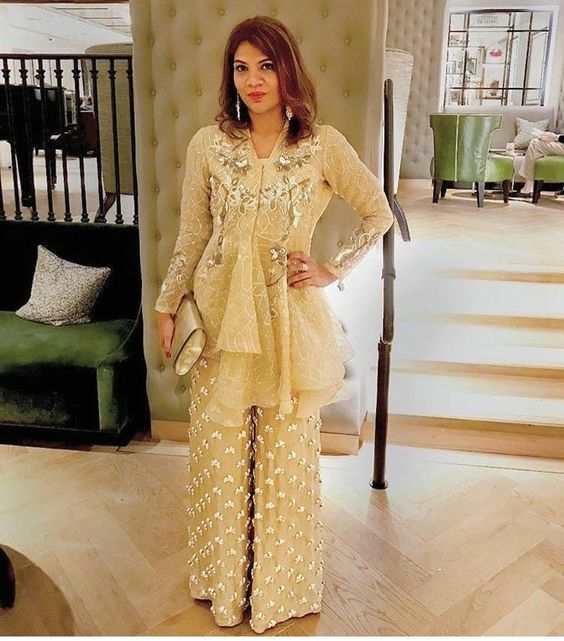 Pro Tip: For mehndi function sharara trousers looks so much classy, hence you can pair it with kurti. 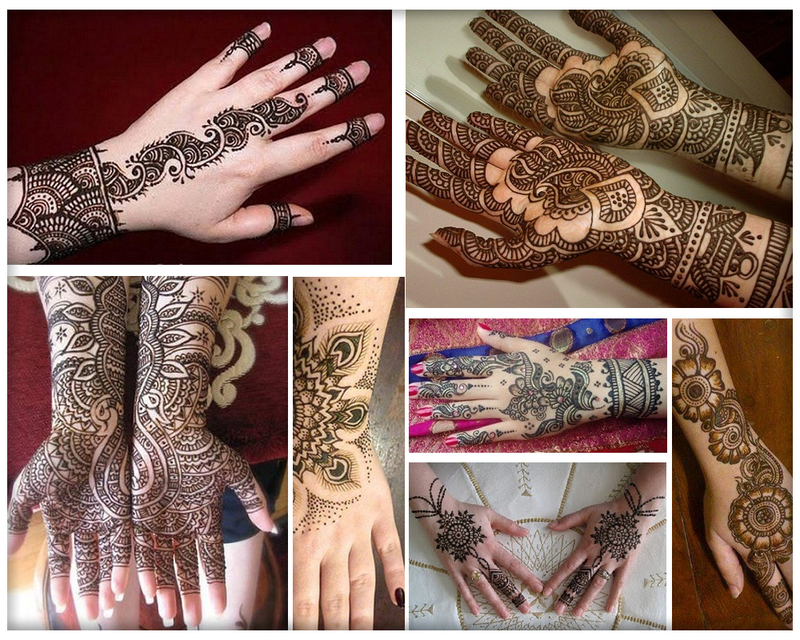 For bridal mehndi dresses click this link. As the name implies wide length pants are loose fitted version of straight pants, that are now in fashion with any sort of outfit. 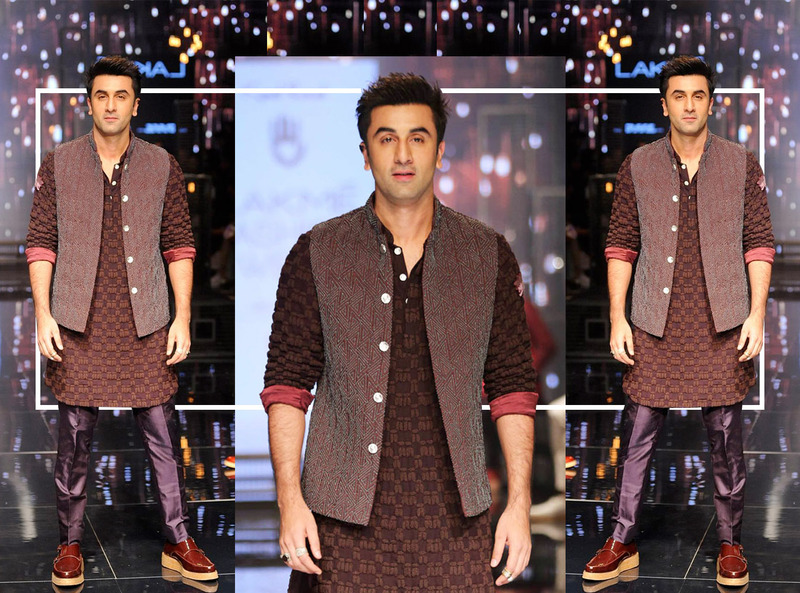 These can also be stitched in a variety of designs so have look on wide length pants images below. 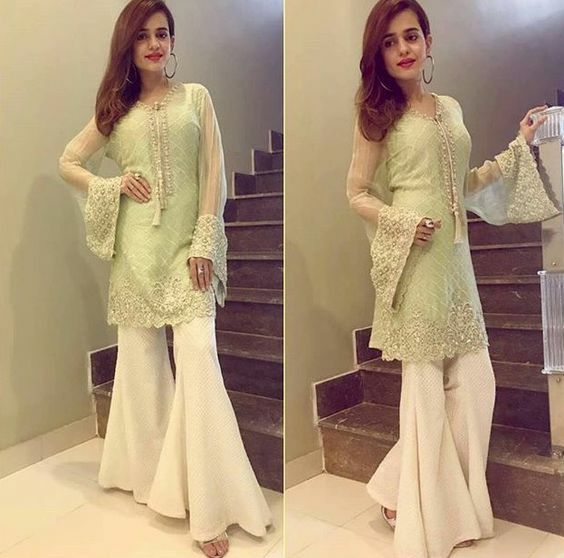 Pro Tip: If your height is short never go for wide length pants, these are best for heighted girls. 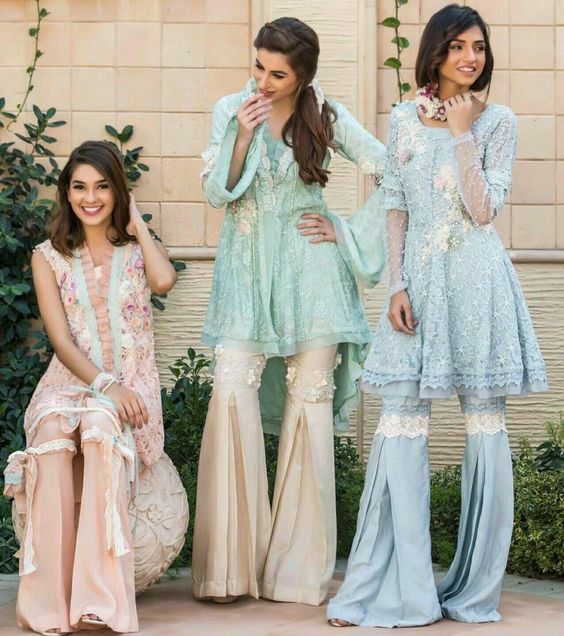 Above you have explored stylish trouser designs 2018 that include, bell bottom pants, sharara pants, tulip shalwar, plain shalwar and wide length pants all these can be paired with any sort of attire but keep in view the tips that are given above. If you like my little effort follow me on social media by clicking on the social media buttons on top right corner of this page and share this post with friends and family members. For more stitching design ideas about sleeves and necklines keep visiting Fashion Glint.